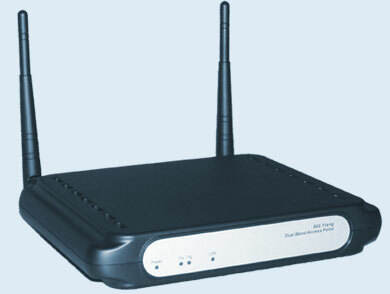 WX-7800A Wireless 11a+g Dual-Band Access Point can be accessed in all three 802.11 wireless networks. WX-7800A contains two separate wireless connectivity radio transceivers, which support all three popular wireless networking specifications. One of the two transceivers uses 2.4GHz frequency band and supports both wireless 802.11b and 802.11g, which offers up to 11Mbps and 108Mbps data rate respectively. The other transceiver uses 5GHz frequency band and supports wireless 802.11a, also at 54Mbps. Since two radio waves operate in different frequency bands, they can work simultaneously and cover your wireless zone with high-speed performance. In terms of security, WX-7800A offers up to 152-bit WEP Encryption. It also includes the MAC address filtering, which allows you to assign the Internet Access to those you want to. The configuration and installation is made to be simple and fast following the web browser-based setup wizard.